Our Mueller Martini 7-into-1 inserters provide our customers additional revenue opportunities by allowing inclusion of pre-printed inserts. 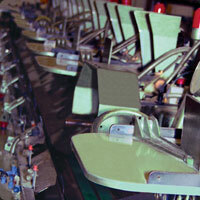 With 7 pockets we can insert multiple sized products up to 8,000 pieces per hour. Inserting services from Nowata Printing allows our business customers to increase revenue by placing pre-printed inserts into existing printed materials—these are what you see in magazines where they offer you a subscription, coupons, product samples, and advertising booklets. We print your magazine, newspaper, booklet, or other main printing project first, then print the inserts and place them in the original product where you indicate with easily removable binding, such as perforated tear off sheets. These can be the same size or smaller than the full printed size of your magazine or other publication. Nowata Printing can produce these easily and effectively, so contact us to find out more.